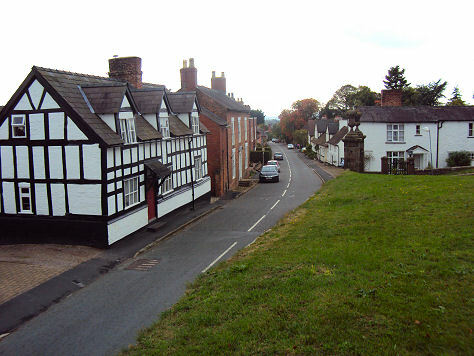 The small attractive town of Malpas lies on the course of the old Roman road from Whitchurch to Chester and is one of the oldest towns in the county of Cheshire. The town spreads down the hillside from its medieval church. Malpas town is mentioned in the Domesday Book under the name of Depenbech, meaning ‘at the deep valley with a stream in it’. This suggests the location of the original settlement may have been at Hough Bridge, south from the village’s present hilltop location. The current curious name derives from the Norman French 'mal passe' meaning bad passage and refers to the route close to the village which ran down the fiercely disputed border between Cheshire and Wales. In the late medieval period the landowners were the Breretons, later part of the town passed to the Cholmondeleys, who built the town's almshouses, which still survive, in the eighteenth century. The town's characterful winding streets converge at the market square with its black and white half timbered cottages and handsome Georgian houses . All that remains of the original medieval market cross which once stood in the market square are the present sandstone steps, the original cross was taken down in the nineteenth century. 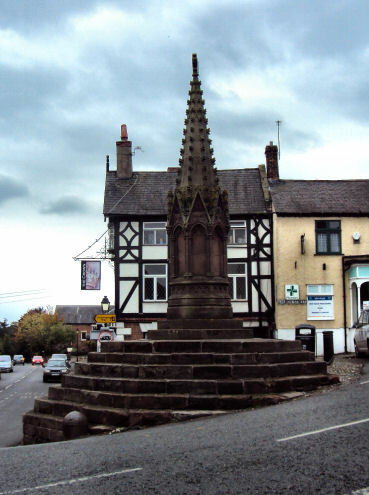 The current gothic crocketted Cross was erected as a memorial to Rev Charles Thurlow who was the Higher Rector of Malpas form 1840-73. 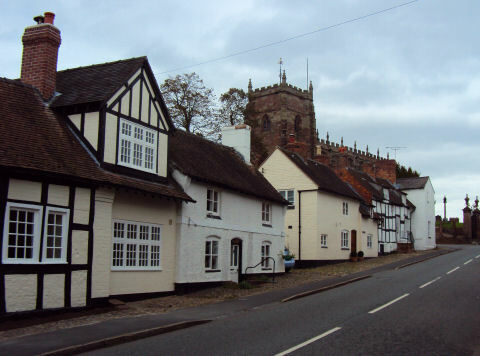 Malpas contains many historic buildings of interest. Tudor Cottage in Old Hall Street is a seventeenth century timber framed building. Drake House Drakes Cottage and Drake House have the Drake monogram and date from 1768. The Stuart king, James I once lodged at the Red Lion Inn, once an old coaching inn. The Tithebarn is a half timbered building dating from the seventeenth century. It was once used to store tithes, a tax of one tenth of agricultural produce exacted by the church. Church View is a seventeenth century timber framed house which was once the Griffin Inn. St Oswald's Church stands adjacent to the site of a motte and bailey castle and is a Grade I listed building. 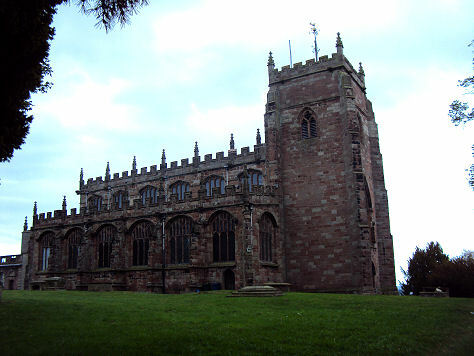 The red sandstone building boasts a superb nave roof of carved oak and is reported to be one of the best examples of a late fifteenth to early sixteenth century church in Cheshire. An oak chest, kept in the nave, dates from the second half of the thirteenth century. The interesting octagonal font is of fifteenth century origin, although its oak cover is a later addition (1627) The superb nave ceiling is constructed with camber beams and is decorated with bosses and carved angels. The tombs in the chantry chapels are of particular interest, the Tudor tomb in the Brereton chapel is of Sir Randolph Brereton and his wife, and is dated 1522, Sir Randolph Brereton was a great benefactor of the town. The alabaster monument in the Cholmondeley chapel was erected in 1605 and represents Sir Hugh Cholmondeley and his second wife, Mary. Also within this chapel is a memorial by Westmacott to Lady Cholmondeley who died in 1815. The mound which the castle once stood upon stands to the north of the church. The town's most famous son was Bishop Reginald Heber, who was born in the rectory in 1783, and is famous for writing the hymns 'Holy, Holy, Holy' and 'From Greenland's Icy Mountains'. He was eventually to become Bishop of Calcutta. The church contains a memorial to him in its east window. Malpas offers a range of shops and accommodation. Cholmondeley Castle Gardens The large ornamental gardens at Cholmondeley Castle, near Malpas, are superb, dominated by the red sandstone Gothic style Castle, which dates from 1801. The castle was built by George Cholmondeley, 1st Marquess of Cholmondeley. It was designed by the local architect William Turner who was directed by the Marquess to give it the appearance of "an old Gothic Castle.